This post has 4,089 views. My new TV, with the antenna at the lower left corner of the photo. I finally bought a TV for my apartment during Black Friday. Before that I lived without a TV for three months, which is longest period I’ve gone without a TV in recent memory. I had internet so in principle I can get any news I want, but I wanted to watch some local news so I decided to buy a TV. I ended up buying the TCL brand 32 inch LCD from Amazon.com on Black Friday. 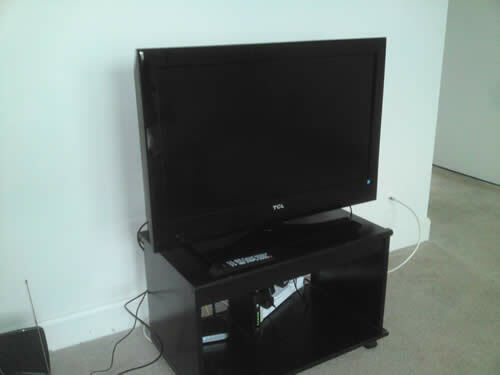 It was on sale for $250 (and had free shipping), which was pretty good for a non brand name 32 inch. There were cheaper 32 inch sets on sale that day, but I’d have to go line up early morning in the cold, which I decided wasn’t worth it. As long as the TV is reliable and looks okay, I don’t really care about brand names and rather save a few bucks. After the TV arrived, I had to buy an antenna to receive the channels because I didn’t feel like spending 30+ bucks a month paying for cable. The good thing about the US is that most local stations have switched to digital broadcasts, and many of them broadcast in high definition so supposedly you can get a pretty good picture with an old-school antenna. The last time I remember using an antenna for TV was probably around 15 years ago, so it’s kind of like going back in time haha. Anyways, the first antenna I tried was a Phillips SDV2210 which was $10. The antenna is just a basic rabbit ear plus loop. I tried it with my TV and got around 15 channels. Out of the major networks, I can get NBC, ABC, PBS, and CW loud and clear in HD, but the results weren’t as good for the other networks. I couldn’t get CBS or Fox at all, and the reception for MyNetworkTV wasn’t great. I wanted to see if I can get better reception with another antenna, so I went out and bought a Phillips SDV6122 amplified antenna for around $30. With this antenna, I can finally receive Fox and can get clear reception for MyNetwork TV, but both of these stations are finicky. I had to move the antenna around the TV for quite a bit to find a location where I can get good reception for both stations, and now I kind of know how people fiddled with their rabbit ears in the old days before cable/satellite became prevalent. I still can’t get the local CBS affiliate on their own channel, but that’s because they are on a VHF channel which I heard can be hard to receive, and CBS was carried on another UHF channel which I do get. I’m happy that I can watch all the major networks, so I’m probably going to stick with the SDV6122. Even though I’ll still be on my computer longer than I watch TV, it’s good to be able to watch some local news and also sports, movies and other shows once in a while, and better yet a lot of the shows are in HD. Hopefully my new TV and antenna will stay problem-free for years to come.